While the basics for production activity – minimization of costs, maximization of efficiency and productivity – are a constant, it is increasingly important to adapt to rapid shifts in business and technology. Today, in an age of digital transformation and technological innovations, the manufacturing market has become extremely competitive and manufacturers have to keep up to date by implementing different state-of-the-art approaches and concepts in order to get an advantage against rival companies. One of the most disruptive innovations taking over the manufacturing industry is the Internet of Things. It has advanced well beyond science fiction and is infiltrating plants, factories, homes and businesses all over the world. Optimization of manufacturing systems using the internet of things (IoT) is the main trend in the tech world today. According to the International Data Corporation (IDC), a total IoT spend of the manufacturing industry in 2016 was $178 billion, which is twice as much as in transportation, the second largest vertical market in IoT spend. WHAT ARE IoT & IIoT?? It is quite a challenge to provide a definition of IoT as the term is extremely broad. Essentially, the Internet of Things, commonly abbreviated as IoT, is a network of connected devices, intelligent computers, objects and sensors that are able to interact with each other and exchange huge amounts of data over the Internet. The Internet of Things (IoT) adds manufacturing value by increasing efficiency, improving health/safety, and creating better experiences mostly related to consumer applications. 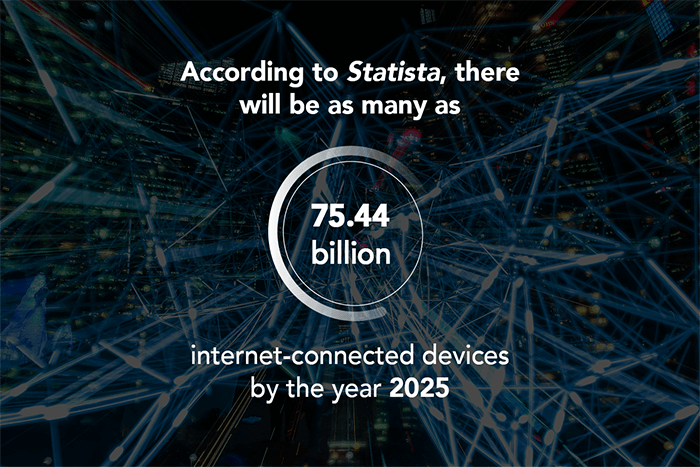 According to Statista, there will be as many as 75.44 billion internet-connected devices by the year 2025. IIoT stands for the Industrial Internet of Things and refers to a subcategory of the broader Internet of Things, focusing specifically on industrial applications, such as manufacturing. Adoption of IIoT solutions allows manufacturing companies to reduce costs and increase productivity, meaning more tangible return-on-investment compared to the more consumer-level oriented IoT. The clearer near-term benefits account for more incentives for IIoT implementation, thus putting it in many ways ahead of IoT. Companies like Airbus, Boeing, Hitachi, Huawei, ThyssenKrupp, Caterpillar, Rolls Royce, etc. are already reaping the benefits from being early IIoT adopters. The rise of IoT in manufacturing. Despite the fact that this technology has emerged only recently, the global IoT market is growing at an unprecedented rate. According to MarketsandMarkets, the overall IoT market size is expected to increase from USD 170.57 billion in 2017 to USD 561.04 billion by 2022, growing at a compound annual growth rate (CAGR) of 26.9% during the forecast period. Today we can see the increasing deployment of IoT solutions not only by huge internet-related companies like IBM, Microsoft, Oracle, Intel etc. but also by a rapidly growing number of companies representing a wide range of various market sectors. Therefore, it is not surprising that IoT attracts huge amounts of investments. Almost 100 billion USD is flowing in IoT market yearly and, according to Bain, the annual revenue of IoT companies by the year 2020 is forecasted to surpass 450 billion USD. The leading position in the range of IoT implementing companies rightly belongs to the manufacturing industry. The IoT in the manufacturing market is projected to grow from $12.67 billion in 2017 to USD 45.30 billion by 2022, at a compound annual growth rate (CAGR) of 29.0% during the forecast period of 2017–2022, as provided by MarketsandMarkets. The opportunities for the implementation of IoT in the manufacturing field, apart from the production cycle itself, are mostly related to such areas as product storage and transportation. With economics becoming more and more global, large manufacturers are forced to adhere to the introduction of smart manufacturing. Manufacturers are of the opinion that shipping, warehousing and document management to be the best process fields to improve operational accuracy and performance of manufactures. Tracking of imported and exported goods is considered as the most promising application of IoT in shipping/logistics/transportation, while intelligent warehouse solutions help to manage real-time product flows, stock and inventory within the warehouse. The third place is occupied by document management, where IoT can provide real-time updates of process information. The Industry 4.0 concept assumes that modern manufacturing systems generate huge amounts of data that must be collected, stored, managed and analyzed. Implementation of IIoT allows employees to focus on their work while the IoT algorithms monitor equipment or make safe-checks. It also brings about an improvement of data mining capacities for the entire manufacturing industry and makes it possible for manufacturers to take faster and better real-time decisions allowing to avoid potential problems. The advent of IoT to the manufacturing industry has truly revolutionized this sphere. Let us disclose the benefits it has brought to some of the manufacture- related areas where IoT application demonstrates its usefulness most vividly. The conventional approach to manage equipment has so far relied only on its age, leaving other metrics, such as vibration, temperatures, pressure, currents, voltages, etc. neglected. Implementing IoT manufacturing solutions helps companies monitor and analyze various equipment data in real-time and predict when maintenance of an asset is required. As a result, manufacturers can move from the repair-or-replace current maintenance model to a predict-and- fix model. According to IoT Analytics, the total predictive maintenance market is expected to grow from $1,498M in 2016 to $10,962M by 2020. Caterpillar, one of the leading corporations, specializing in the production of machinery, was one of the first to start implementing IoT systems, thereby optimizing and rationalizing most of its operational processes. A preventative maintenance analysis carried out by the company allowed it to come to the conclusion that using more low-power generators is more efficient than using a smaller number of generators with high power. The savings were estimated at $30 per hour, making a total of $650,000 a year. What does it mean? IoT sensors and connected devices track changes in various equipment parameters and convey collected information to manufacturers. This provides companies with an insight into the equipment performance and sends an alert each time when the indicator shows a parameter that differs from the prescribed one. With this manufacturing solution companies can reduce costs by at least 40%, conserve energy and eliminate downtime. ABB, an international company specializing in electrical and power engineering, has long utilized the benefits of the IoT technology. By analyzing and monitoring low-voltage-motors parameters, the company discovered that the use of IoT system allows to reduce the downtime by 70%, expand the motors lifetime by at least 30%, as well as decrease energy consumption up to 10%. Today, when the manufacturing operations are increasingly complex and large companies develop global supply chains, manufacturers are forced to monitor and react to vast external factors in order to ensure supply inventory needed for their production. Implementation of smart IoT devices and machines allows manufacturers to deal with the growing complexity of supply chains and spot potential problems before they turn into real problems. The world’s largest shipping company Maersk equipped their containers with IoT sensors, which allowed it to monitor and track them on route. As a result, the number of frauds and delays was considerably reduced, saving 15% of the cargo value accounting for billions of dollars. IIoT devices and systems allow providing the exchange of operational information and control over values, switches and different field devices to the central digital system. This allows companies to have a clear view of all assets and an understanding where the thing are going well and where not. The connected factory reduces the risk of accidents and unplanned downtime. IIot networks connect not only workers, data and processes but also executive offices. The collected data of the IoT system provide a full view of the business state and allow to control it remotely. Due to the introduction of the IoT technology, an international company producing electric and cordless power tools Black & Decker considerably improved its production line effectivity. The use of IoT identification tags ensured real-time monitoring of assets and provided mobile access to all operational data. As a result, Black & Decker raised its labor effectiveness by 10% and production efficiency by up to 24%, as well as enhanced the utilization rates to 90%. Today, quality control is traditionally performed on the basis of subjecting the finished product to various tests aimed at detecting any flaws and confirming its conformity to relevant standards. This approach, however, does not ensure that the product is free of any potential problems that could turn out as a result of any violations in the process of its manufacturing. Alternatively, IIoT allows manufacturers to control the “health’ of the equipment in real time and adjust preventive maintenance schedules on the basis of the machines actual wear. It improves the operational efficiency and reduces the downtime. 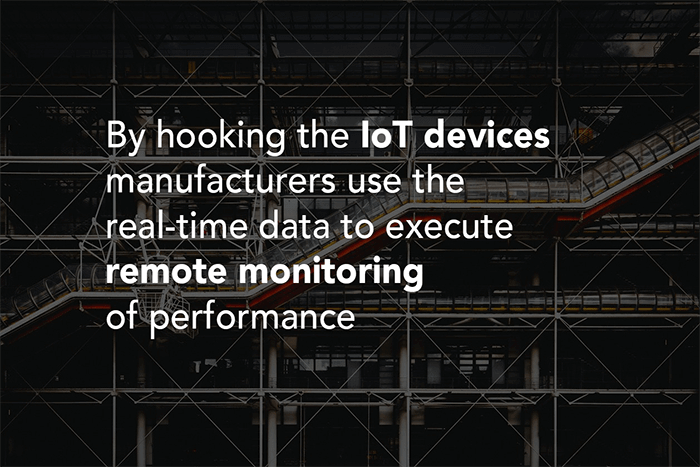 By hooking the IoT devices manufacturers use the real-time data to execute remote monitoring of performance and progress of work. Enterprise Sensor Integration (ESI) platform developed by Tapestry Solution, а sub-organization of the Boeing Company, is aimed at improvement of the inventory management, automation of manufacturing processes, reduction of downtime and better quality control. The company estimated that during the first year it was introduced ESI saved Boeing $100,000 million. The business potential of IoT is enormous and today more and more companies are looking for new opportunities for its implementation in their respective spheres. Manufacturing is undergoing a technological revolution and it is the degree of the implementation of the most innovative technologies, such as IoT and IIoT, will eventually account for whether a company or even a country will prosper or decline. Evolve or die, the choice is always about that.